Is that fear or fun on my face... I don't know. I'm kinda nervous just looking at it. Might be a little intense for a Tuesday morning, but hang in their folks... we are talking about irrational fears today. Even more than just TALKING about irrational fears, today I have to live through one. Ever since I was a human, I've always remembered having deep seated, irrational, probably unhealthy, and totally based in (non)reality fears. It is kinda like a part of me. How do I mean that? Oh easy! I climb the stairs at my childhood home in a zig zag fashion to avoid the sniper that is obviously hanging out in the dirty, dangerous suburbs of Houston. I pray the Our Father and Hail Mary literally every single take off and landing in an airplane (about 1 out of every 3 flights people ask me if it is my first flight). And on multiple occasions I have come inches away from ninja chopping an 'attacker' on my nightly runs just to profusely apologize to some poor soul that had the misfortune of running at the same time as me. I know, I'm a horrible person. I should stop existing in the real world until the psych team from Criminal Minds comes and evaluates me because this is definitely not normal. But today, today I have to deal with another one of those irrational fears. Now, this isn't the first time that I've had to get my shiz together and be a real person. 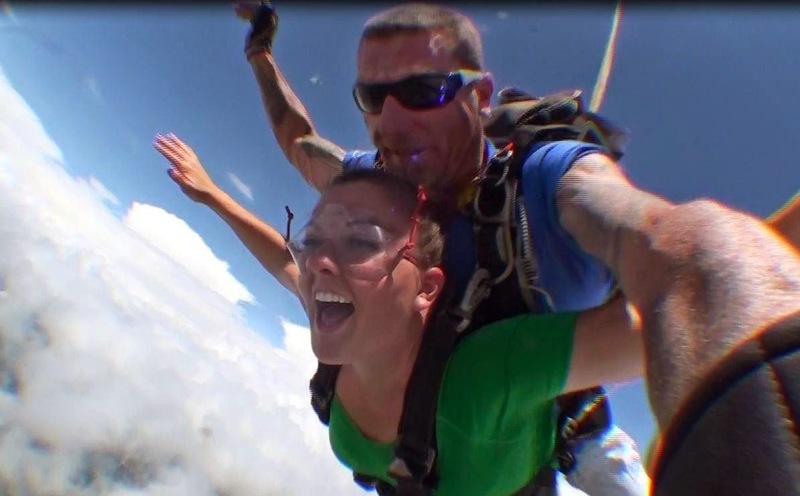 In the summer of 2012 I forced myself to jump out of an airplane and speed to my inevitable death skydive. I kid you not, my sisters and brother in law had bought a GROUPON (life choices... groupon for skydiving?) and asked me if I wanted to join. The words out of my mouth shouldn't appear in public, but I think you get my immediate drift- I WILL ABSOLUTELY NOT DO THAT WITH YOU. WHY ARE YOU SO STUPID? WE MUST NOT SHARE THOSE SAME GENES! Then I felt guilty. And I was afraid I may be missing out on a priceless bonding experience. And I convinced myself that I needed to do it. After coming to my decision (and calling the skydive place to harass them about fatality rates) I told my parents the week before (trying to keep it a secret from my sisters who were out of town). My wonderful parents, who have supported me in all sorts of crazy decisions like getting a degree in theatre and referring to my puppy as my brother, responded with "don't ruin this for your sisters." LITERALLY. You can't make this up. Don't. Ruin. This. For. Your. Sisters. Obviously, I'm really a brave person, have never backed out of any life threatening activities before, and am not dramatic about my life. They must have been confused and thought I was someone else with that luke warm (at best) response. But I did it. And I LOVED IT. Skydiving was thrilling with such a rush. The free fall feeling was ethereal and when you touch the ground at the bottom adrenaline is pumping through every inch of your body. I absolutely LOVED the experience and felt so proud of myself to get over my massive fear of heights. That leads us to Tuesday morning. No, I don't get to do something as cool as skydive... I have to get blood drawn. Are you let down by my irrational fear? You probably should be. It isn't a glamorous fear or even a fear that makes much sense, but I have to bite the bullet to get poked and prodded, shots and tests, blood drawn and whatnot for my new job. And I'm TERRIFIED. Want to know about the last time that I got blood drawn? The nurse asked if I had fasted and I started sobbing. She asked why I was crying and I said I wasn't. WHY WOULD I SAY THAT- I WAS OBVIOUSLY BAWLING. Then she told me in the nicest way possible that I couldn't get blood drawn in my 'state' and had to leave. Yes. A low point in my life. I was kicked out of a doctor's office. So actually that wasn't the last time I got my blood drawn... because I didn't manage to actually accomplish the task. But Tuesday morning, I have to do it. I need to go there, pretend it is okay, and listen to this song on repeat till I can leave. Very fittingly at Monday night's yoga class, the instructor ended class with a speech on balance. This oddly timed diatribe seemed so out of place in the moment, but driving home I realized how perfectly fitting it was. In yoga, balance is finessing both sides of your body so while you are acknowledging each side may feel different that day (one hip is open or you're carrying stress heavily in one shoulder instead of the other) you aim to eliminate preferences in your movements. We can also do this in life. By eliminating the small preferences in life, we can avoid disappointment after disappointment while adding content to our lives. Wow- that sounded really intense, bear with me. I can't imagine how much happier I would be if I stopped hating Mondays and realized they were just like every other day of the week. Or if I didn't get so snooty about when Trader Joe's doesn't have any of the sharp, sharp, sharp cheddar in a package socially acceptable for me to consume in a week. So that is what I am trying to convince myself will happen at this appointment. I will acknowledge that yes I'm IRRATIONALLY TERRIFIED of this silly appointment and choose balance instead. This is hilarious! Once I put my fitbit in the acrylic jewelry holder in the closet overnight, and it had a 6:00am alarm go off, so I'm getting ready in the bathroom and it starts vibrating and I have no clue what it is -- my first thought is literally "Oh my god, someone is hiding in the closet, they snuck in, waited here all night and are going to kill me and now their phone is going off and I heard it so now my demise is even closer!" WHAT?! I think maybe when Criminal minds comes to you, give me a call so I can join in. Good luck with the blood draw, you'll be fantastic!!! Good luck today, It'll go great - second time is a charm :) I'm with you on the running up the step thing too haha! Was it today? I hope it went well! Just start a conversation with the nurse to distract yourself and look the other way! You got this.